Gennady Ivanovich Yanayev (Russian: Генна́дий Ива́нович Яна́ев; 26 August 1937 – 24 September 2010) was a Soviet politician who served as the first and only Vice President of the Soviet Union. Yanayev's political career spanned the rules of Khrushchev, Brezhnev, Andropov and Chernenko, and culminated during the Gorbachev years. Yanayev was born in Perevoz, Gorky Oblast. After years in local politics, he rose to prominence as Chairman of the All-Union Central Council of Trade Unions, but he also held other lesser posts such as deputy of the Union of Soviet Societies for Friendship and Cultural Relations with Foreign Countries. Due to his chairmanship of the All-Union Central Council of Trade Unions he gained a seat in the 28th Politburo and Secretary of the Central Committee. Later that year[when? ], with the help of Mikhail Gorbachev, Yanayev was elected the first, and only, Vice President of the Soviet Union. Having growing doubts about where Gorbachev's reforms were leading, Yanayev started working with, and eventually formally leading, the Gang of Eight, the group which deposed Gorbachev during the August coup of 1991. After three days, the coup collapsed, in part due to western backing of Boris Yeltsin, but during its brief grip of power Yanayev was made Acting President of the Soviet Union. He was then arrested for his role in the coup, but in 1994 he was pardoned by the State Duma. He spent the rest of his life working in the Russian tourism administration until his death on 24 September 2010. Yanayev was born on 26 August 1937 in the town of Perevoz, Gorky Oblast during the height of Stalinist repression in the Soviet Union. He graduated from the Gorky Institute of Agriculture in 1959. After graduation he worked as the head of a mechanised agricultural unit and later as a chief engineer in the Gorky Oblast. He applied and officially became a member of the Communist Party of the Soviet Union (CPSU) in 1962. From 1963 to 1968, he held the positions of second, and subsequently first, secretary of the Gorky Komsomol, and later became Chairman of the Committee of Youth Organisations, which he held for 12 years. From 1980 to 1986 he was Deputy Chairman of the Union of Soviet Societies for Friendship and Cultural Relations with Foreign Countries. He became Secretary for International Affairs of All-Union Central Council of Trade Unions in 1986 and became Deputy Chairman of the trade unions in 1989. In April 1990 he was elected Chairman of the All-Union Central Council of Trade Unions. As chairman of the trade unions, he was not able to quell the growing labour discontent in the country, but his position granted him a seat in the Politburo of the Communist Party of the Soviet Union (CPSU) at the 28th CPSU Congress (held in 1990), alongside his election as Secretary of the Central Committee. On 27 December 1990, Mikhail Gorbachev proposed Yanayev as Vice President of the Soviet Union. He was Gorbachev's third choice for the post; Foreign Minister Eduard Shevardnadze and Kazakh president Nursultan Nazarbayev had turned the offer down. Yanayev had initially been rejected by the Supreme Soviet, but he was finally approved due to Gorbachev's insistence, only days after Shevardnadze had resigned from office due to Gorbachev's willingness to give leeway to conservatives. Some weeks after Yanayev's election, a senior Soviet official described Yanayev as "Gorbachev's Quayle—a conservative nonentity, no threat to Gorbachev, and his selection would pacify the right-wing". At the beginning of January 1991, Yanayev headed a committee working on the formation of a new cabinet. Later, he was sent to the Soviet city of Kuznetsk to negotiate with a newly formed independent trade union, making this the first time since 1917 that a Russian government official had negotiated with a trade union. However, after gaining the attention of the Soviet government, the unionists withdrew their plans for a strike. Shortly after taking office, Yanayev joined a group of more conservative Communist politicians who hoped to persuade Gorbachev to declare a state of emergency, led by KGB chairman Vladimir Kryuchkov. After Gorbachev announced his proposal for a New Union Treaty to form the Union of Sovereign States, as a reorganisation of the Soviet Union into a new confederation, he went on vacation to his dacha in the Crimea. Believing that this new Union treaty would lead to the disintegration of the USSR, the State Committee of the State of Emergency placed Gorbachev under house arrest on 19 August, one day before the treaty was due to be signed. On that same day the Telegraph Agency of the Soviet Union (TASS) issued the coup plotters' decree, which stated: "Owing to the conditions of his health, Mikhail Gorbachev is no longer capable of carrying on the duties of the President of the USSR. In accordance with article 127, clause 7 of the USSR constitution, Vice President Gennady Yanayev has assumed the duties of the President of the USSR." The decree made references to the growing problems facing the country such as ethnic tensions, political confrontations and chaos, which according to the coup leaders threatened the very existence of Soviet life and the territorial integrity of the USSR. Yanayev further claimed that the danger of collapse was imminent, and if the economic situation was not handled quickly, the Soviet Union would collapse. In addition, Yanayev and the rest of the state committee ordered the Cabinet of Ministers to alter the then current five-year plan to relieve the housing shortage. All city-dwellers were given one third of an acre each to combat winter food shortages by growing fruit and vegetables. When asked about Gorbachev, Yanayev replied "Let me say that Mikhail Gorbachev is now on vacation. He is undergoing treatment, himself, in our country. He is very tired after these many years and he will need some time to get better." 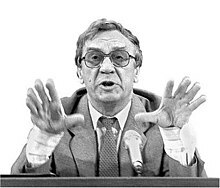 At a press conference Yanayev's hands were shaking rather violently, leading many journalists to focus on Yanayev's apparent drunkenness instead of Gorbachev's allegedly bad health. On 19 August, citizens of Moscow gathered around Russia's White House and began to erect barricades around it, in which at 16:00 Yanayev responded by declaring a state of emergency in Moscow. Yanayev declared at the press conference at 17:00 that Gorbachev was "resting". He said: "Over these years he has become very tired and needs some time to get his health back." Yanayev said the Emergency Committee was committed to continuing his reforms. However, Yanayev's weak posture, trembling hands and shaky expressions made his words unconvincing. According to some historians, Yanayev was the most visible and powerful member of the Emergency Committee but was not its mastermind; Kryuchkov has been described as the "heart and soul of the conspiracy". Yanayev only agreed to head the Emergency Committee on 20 August. Along with the other coup leaders, such as Valentin Pavlov and Boris Pugo for instance, Yanayev was dismissed as Vice President and later jailed for his "crimes" against the Soviet state. In 1993 Novy Vzglyad quoted Yanayev as admitting that he was drunk when he signed the decree which made him acting President, but saying that inebriation had not affected his judgment. In an interview from 2008, Yanayev said he regretted making himself acting President, further claiming that he was pressured by the more conservative members to sign the documents which declared his own presidency. He described the events of 1991 as a burden for the rest of his life. Three years after the dissolution of the Soviet Union, Yanayev was freed by an amnesty of the Russian State Duma in 1994. He would eventually become the head of the Department of History and International Relations of the Russian International Academy of Tourism. On 20 September 2010, he fell ill and was hospitalised at the Central Clinical Hospital in Moscow, where he was diagnosed with lung cancer. He died on 24 September 2010. The Central Committee of the Communist Party of the Russian Federation (CPRF) expressed their condolences to Yanayev's family. Gennady Zyuganov, the leader of the CPRF, said of him: "Yanayev lived an interesting, complicated and worthy life." The CPRF officially praised him as "a highly professional specialist [...] a dear and trustworthy comrade". In another statement made by the CPRF, this time on their official website, they claimed: "If they had acted much more decisively, our unified country would have been preserved." He was buried at the Troyekurovskoye Cemetery, in a ceremony attended by several prominent CPRF members. He was survived by his wife and two daughters. ^ a b c Schwirz, Michael (24 September 2010). "Gennadi I. Yanayev, 73, Soviet Coup Plotter, Dies". The New York Times. Retrieved 25 September 2010. ^ Громыко Андрей Андреевич (in Russian). hrono. Retrieved 2 October 2010. ^ Steele, Jonathan (26 September 2010). "Gennady Yanayev obituary". The Guardian. Retrieved 15 December 2010. ^ Kulikov, Anton (28 September 2010). "The man, who tried to save the USSR". Pravda Online. Retrieved 1 October 2010. ^ Pry, Peter Vincent (1999). War Scare: Russia and America on the Nuclear Brink. Westport, Connecticut: Greenwood Publishing Group. p. 58. ISBN 0-275-96643-7. ^ Биография Геннадия Янаева: ветеран и инвалид госслужбы (in Russian). Temadnya. Retrieved 25 September 2010. ^ a b Garthoff, Raymond L. (1994). The Great Transition: American-Soviet Relations and the End of the Cold War. Washington, D.C.: Brookings Institution Press. p. 442. ISBN 0-8157-3060-8. ^ Neimanis, George J. (1997). The Collapse of the Soviet Empire: A View from Riga. Westport, Connecticut: Greenwood Publishing Group. p. 76. ISBN 0-275-95713-6. ^ a b "Russian Reaction". PBS NewsHour. 19 August 1991. Retrieved 25 September 2010. ^ "Gennady Yanayev". The Daily Telegraph. 12 October 2010. Retrieved 15 December 2010. ^ a b Тоннель на крови (in Russian). nr2. 18 August 2006. Retrieved 25 September 2010. ^ Государственный комитет по чрезвычайному положению в СССР (in Russian). souz. Retrieved 25 September 2010. ^ a b "Soviet coup leader Gennady Yanayev dies". BBC Online. 24 September 2010. Retrieved 26 September 2010. ^ "Soviet coup plotter Gennady Yanayev dies at 73". USA Today. 24 September 2010. Retrieved 15 December 2010. ^ Один из идеологов ГКЧП Геннадий Янаев скончался в московской больнице (in Russian). echo.msk.ru. 24 September 2010. Retrieved 25 September 2010. ^ Янаев перед смертью раскрыл правду о ГКЧП (in Russian). LifeNews. 24 September 2010. Retrieved 25 September 2010. ^ Antonova, Maria (24 September 2010). "Soviet 1991 coup leader Gennady Yanayev dies at 73". Agence France-Presse. Retrieved 25 September 2010. ^ Gutterman, Steve (24 September 2010). "1991 Russian coup plotter dies". Toronto Sun. Reuters. Retrieved 25 September 2010. ^ "Лидера ГКЧП Янаева похоронили в Москве". LifeNews. 27 September 2010. Retrieved 28 November 2010. The Last Battle for the USSR. 2010. This page was last edited on 27 December 2018, at 16:59 (UTC).